With a down mattress topper from Pacific Coast®, you don’t have to own a feather bed to experience the luxurious comfort it brings. Just fasten the mattress topper onto your mattress using the anchor bands at the bottom of the bedding and you now have a soft layer of feathers on your bed to provide support without the envelopment you get from larger volume feather and fiber beds. All our bed toppers are manufactured in the USA using high-grade imported down and feathers encased in high thread count 100% cotton fabrics for maximum comfort while you sleep. If you’re always waking up with knots in your back, it may be because the support your mattress gives you is not enough. Pacific Coast® mattress toppers give your mattress a little something extra to help you sleep better at night. Our toppers come in different levels of firmness depending on your needs. Each mattress topper variant is uniquely designed and constructed to give you the right amount of softness combined with enough back support to give you the good night’s sleep you’ve always wanted. You don’t need to worry about nighttime sniffles when you have a Pacific Coast® down mattress toppers on your bed. All our down and feathers go through our signature cleaning process called HyperClean®. This involves washing and rinsing the feathers up to eight times to eliminate dust and other particles that may trigger an allergy. We also use tightly woven Barrier Weave™ fabrics to make sure that the down and feathers do not escape. If you’re not totally allergy-free within 30 days of purchase, we’ll give you your money back (less shipping and handling). Pacific Coast® believes that everyone deserves to have a good night’s sleep. This is why our bed toppers are available in a variety of standard sizes. 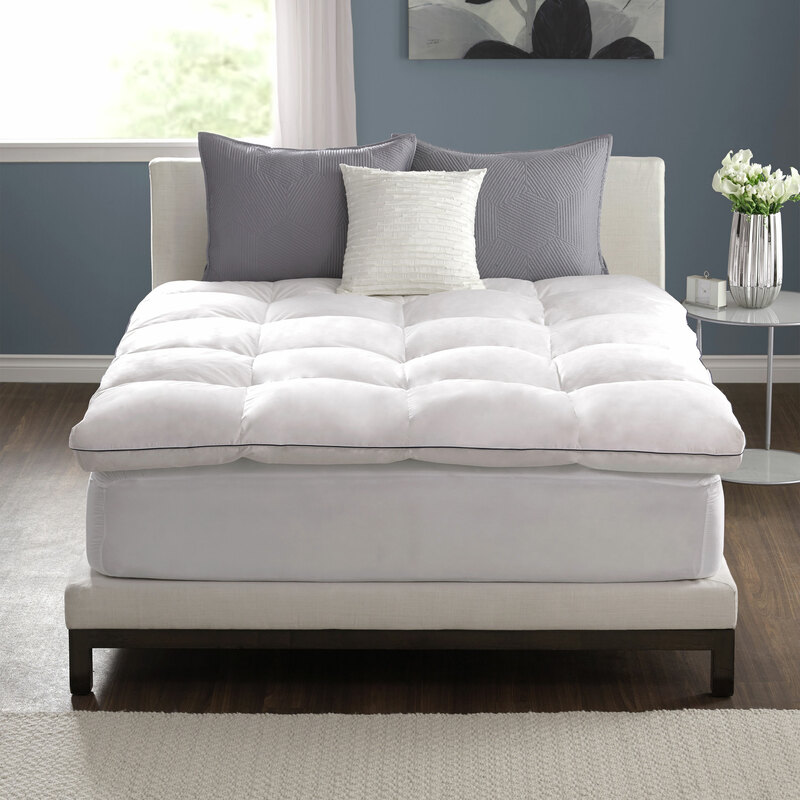 Whether you’re sleeping on a twin size bed, a California King mattress, or anything in between, we have a mattress topper that will fit your mattress like a glove. Say goodbye to plain, flat, and boring mattresses. The mattress toppers from Pacific Coast® come in a wide array of stitching patterns. Not only does it make your bed look good, it also adds to the comfort and support you get when you’re lying down on your bed. The 1-4 inch wall of extra fabric along the edge of the toppers, also known as a Gusset Edge, gives your bed a crisp and sharp look. It also adds height to your mattress. Pacific Coast® uses only the finest materials to make sure that our products meet the high standards we set for ourselves. We are so sure that you’ll feel more comfortable and sleep better with one of our bed toppers covering your mattress that we’re offering a 30-night Comfort Guarantee. Try our product for 30 nights, and if you’re not completely satisfied, just return it and get a full product refund (less shipping and handling). Our products are also made to last, so we’re also giving you a 10-year warranty. You don’t need to throw away a perfectly good mattress just because it’s not giving you everything you need in order to sleep like a baby. Just place Pacific Coast® down mattress toppers on top of your mattress and you’ll feel like you’re sleeping on a cloud.